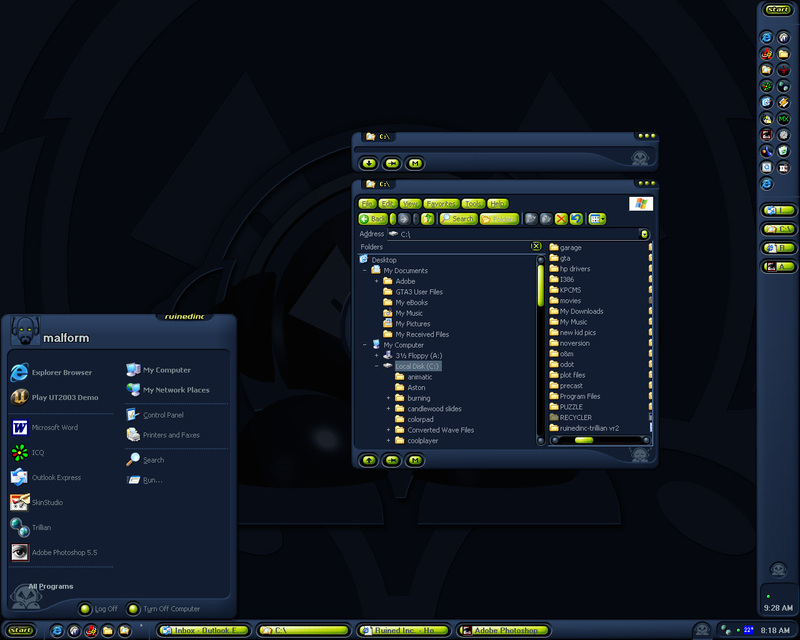 Totally re-built, this skin was made for windowblinds 3.41. There is also a subskin with a border thats a bit thinner on the bottm. To get the wall paper go to our site! Link for some reason I cant seem to upload it here. This is very very cool.My first dark skin! I think I'm gonna change everthing real soon and this will be the base.Thanks for your work and givin it up!! awesome, the original was one of the few themes i still had that didnt have xp support. always been a fav of mine. Wow, this looks great. And I would like to request the wallpaper too because like Cautious said, it goes so well with the skin. ThankS! Sweet. Really nice, tactile skin. Can't believe I somehow missed the original! Ominous! Like the green on black look, though. Nice lookin' start-bar too. This is a beautiful skin mate! i love "dark" ones! It makes looking at my screen for 12 hours a day a WHOLE lot better! I really like this one! Like the buttons, the scroll bar, the toys. I even like the color and I usually don't use dark skins. Excellent work! holy, this is a freakin good skin!!!!!!!!!!!!!!!!!!! im facing some problems with certain apps - microsoft outlook for instance (tries to show blue fonts on a black background). any fix for that?